Hornsea - Heirloom - Coffee Jar - Brown with lid. Condition is Used. No chips or cracks. Lovely piece. Dispatched with Royal Mail 2nd Class. Hornsea Pottery, England: Bronte Table Set Collection. Who were Hornsea Pottery?. This collection includes the following pieces. Hornsea Pottery, England: Bronte Table Set Collection. Who were Hornsea Pottery?. We present these three dinner plates in good condition. IT HAS THE HORNSEA ENGLAND PRINTED MARK UNDERNEATH. Hornsea Pottery, England: Bronte Table Set Collection. Who were Hornsea Pottery?. Charming ceramic SALT PIG STORAGE CONTAINER with fruit detail to front and back from Hornsea in their Yeovil pattern. We will point out any defects as we see them. marked to base with maker’s mark. pattern in good order. 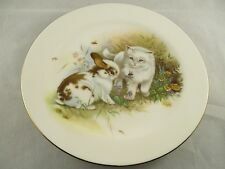 This Hornsea Pottery plate features a beautiful painting of a bunny and kitten. It is from the Country Scene series. The plate is in good used condition. Ben Thomas Porcelain Bottle-neck Vase with a sponge print Autumn Fruits Design. Width Approx: 9cm. Vintage Retro Hornsea Fleur Condiment Set on Board - Oil -Vinegar Salt & Pepper. Dispatched with Royal Mail 2nd Class. Ben Thomas X Hornsea Studio Pottery Large Spongeware Jug. It was made by Ben Thomas who was previously a designer for Hornsea Pottery. "Ben Thomas Jug". Item : Jug. Maker : Ben Thomas (x Hornsea Pottery designer). Very rare mug - beautifully designed by John Clappison. Marked Hornsea and dated on the base. One chip to rim of base, see photos, no other cracks. Still able to use. Retro vintage Hornsea - Heirloom - Coffee Jar with wooden lid in really good vintage condition, except for a tiny tiny chip on outer edge, see pic. Dispatched with Royal Mail 2nd Class. Ben Thomas Porcelain Wide Topped Vase with a sponge print Autumn Fruits Design. Beautiful smooth feel with an eggshell type glaze. Ben Thomas Porcelain, ex Hornsea Pottery. Large 7' Spongeware, Cat & Flower Jug. Ribbed style jug with spongeware cat and flower images. Charming ceramic Large Serving Bowl with fruit detail to front and back from Hornsea in their Yeovil pattern. We will point out any defects as we see them. pattern in good order. Handsome Green with Fluer de Lys Decoration Mug by Hornsea Pottery, East Riding of Yorkshire. In Excellent Used Condition no Chips Cracks Nibbles or Crazing. Height 5', diameter 3'. B22.Reasonable offers considered. I am happy to combine postage if you find something else you wish to purchase. "Ben Thomas Jug" This is a large Studio Pottery spongeware jug decorated with fruit and leaves in multi colours. It was made by Ben Thomas who was previously a designer for Hornsea Pottery. Marked Ben Thomas, Porcelain, England on the base Approx 16 cm high. It's is in excellent condition.